Does Dallas prove “good guys with guns” is a lie? The idea is that there were not only armed police officers present but also citizens with open carry licenses, and yet all these “good guys with guns” didn’t stop the bad guy with a gun from killing people.1 That much is true. The people pointing this out then often conclude that good guys with guns won’t protect us. That much is false. Of course if you mean good guys with guns can’t prevent bad guys with guns from hurting anyone ever again, yes, I agree. But I doubt most gun rights advocates believe or have made such an extreme claim. It’s not that good guys with guns will always be able to keep everyone safe; it’s that good guys with guns will be able to protect people more often than good guys without guns. I think most people on both sides of the gun control debate recognize this to some extent, because almost everyone agrees the police (“good guys with guns”) should be armed. In fact, using Dallas to claim good guys with guns don’t protect us is especially interesting because both civilians and LEOs with guns weren’t able to stop the sniper. Yet gun control advocates are pointing to Dallas as a reason to disarm civlians only, not the police. It’s true that civilians and LEOs with guns were unable to stop the sniper before he hurt anyone, but it’s false to suggest the guns were irrelevant or of no benefit, and it’s nonsensical to suggest that if good guys can’t protect people from a military-trained sniper, they can’t protect people in more typical situations. For example, just yesterday (also in Dallas incidentally), a legal gun owner with a pistol stopped a robber with an AK-47. There are snippet self-defense stories like that regularly, but they don’t make nearly the media ripples that shootings make. I think that’s understandable to some extent: stories about things going right generally don’t get as much attention as stories about things going wrong, especially when things go really wrong. And there’s a matter of degree here too: in terms of media exposure, a snippet about a civilian stopping a robber might be parallel to a snippet about a robber shooting and wounding a single person. They’re both relatively minor stories. 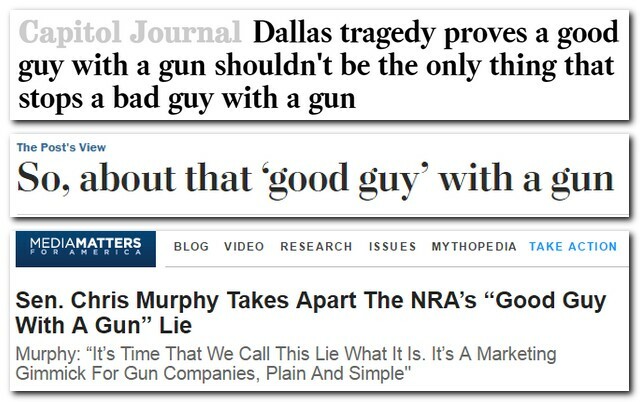 But what would the “good guy” equivalent be to stories about horrific mass shootings? Because a story about preventing a mass shooting doesn’t have nearly the media impact mass shootings have. But I digress. Gun control advocates point out that if the sniper hadn’t had a gun, he couldn’t have done the damage he did. And I think they’re right. I think it’s obvious. I don’t find compelling the gun rights arguments that imply people can be just as dangerous with knives or baseball bats or whatever as they are with guns. I’m open to the possibility that there are gun control measures that can accomplish both of these feats, it’s just not clear to me right now what those measures would be. I think I’ll save that topic for future posts. What a pointless article. Saying that a “good guy with a gun” isn’t effective in this instance is like saying that cops with guns aren’t effective either because neither one killed the sniper. Also, at least one of those “good guys” was ineffective because he was detained by police during the incident for his legal possession of a firearm. There needs to be no stigma attached to the lawful possession and use of firearms. It should be viewed as commonplace as carrying a pocket knife. Oh wait, that’s bad too! When you say “pointless article,” which article are you referring to? Because you’re making similar points in your comment to the ones I was trying to make in my post. It was an unmanned explosive that ultimately took the sniper down. It was police guns that wounded the sniper and caused him to flee.